Gift ideas. Sometimes I can get completely stumped for ideas for gifts. I want to give something, but don’t want the present to be a token something. I want there to be some kind of thought behind it. A little present to say Happy Birthday, Merry Christmas or a simple I’m thinking of you. Not something that screams… uh oh I forgot your birthday up until an hour ago, and this was the first thing I saw…Isn’t it pretty! Here’s one idea for a gift. First stop, go to your local second hand store. One Donna Hay tea cup and little white dish later. ($2 dollars spent, for perfect condition.) 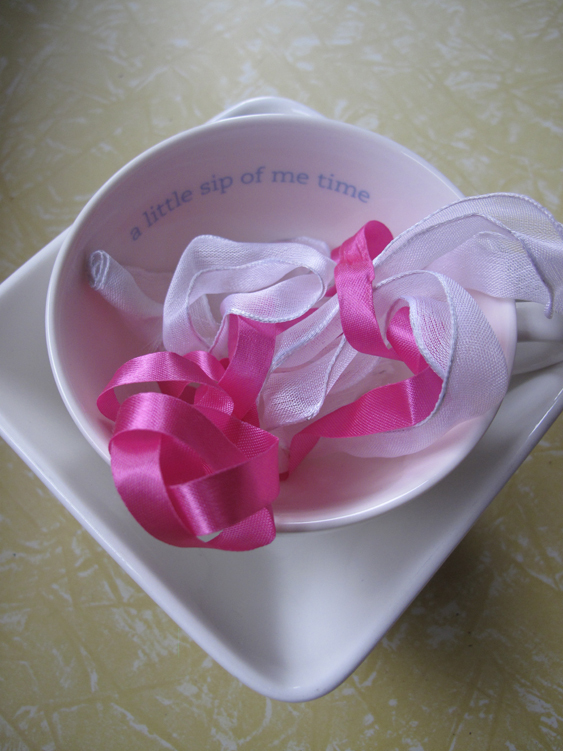 Add some recycled ribbons that I had got via a whole bundle from a LETS trade a while back. Now to fill them. 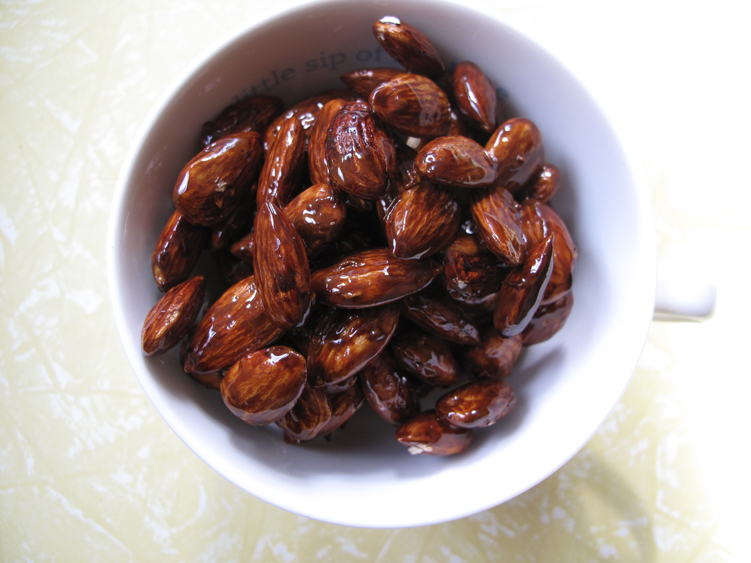 Your desired quantity of raw almonds, coat them lightly in Kecap Manis (Indonesian Soy Sauce). Then put them on a tray and slow roast them in the oven. Done when an almond is cut in half, and lightly browned through. Mix sugar, glucose, honey, vanilla in a pan. Stirring until sugar dissolves. Boil uncovered until reaches small crack stage (a tps of mixture snaps when its dropped into cold water.) This usally takes about 6 minutes or until reaches approx 138C. Beat egg whites until firm peaks form. With mixer running, slowly add hot mixture in a thin stream. Mix for 3 mins or until the mixture holds together, then add the butter. When combined add the nuts. Quickly spread into greased and lined with rice paper tray. Smooth the top down and press the remaining rice paper. Wait until it gets to room temperature, and then cut into desired shapes. Two easy hand made gifts that are made with love, using recycled dishes, and ready to be given to someone that needs a good present. This entry was posted in Food Glorious Food, Going Green and tagged cooking gifts, food, green living, handmade gifts, honey almond nougat, kecap manis, Making, Creating + Frugal Living, presents, recipes, recycling, roasted almonds, second hand shops, upcycling by cityhippyfarmgirl. Bookmark the permalink. Where do you come up with these amazing ideas? Seriously beautiful presentation too. These look wonderful and so simple to put together too. I love getting presents that are well put together with a bit of thought – makes you feel so special that someone has spent time thinking of you this way. I am looking forward to making and tasting these! 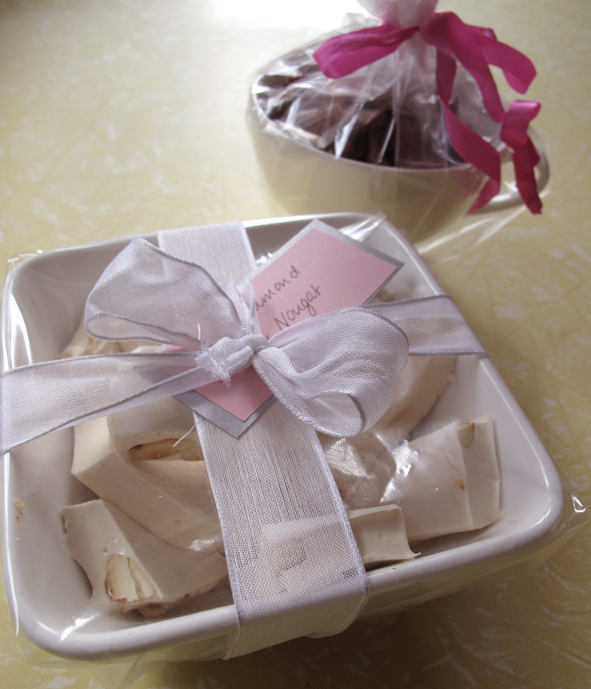 I love gifting from my kitchen- and I’m adding your ideas from your kitchen! I’d love to receive either of these. I often do foodie gifts but hadn’t thought to buy bowls to put them in. Great idea – thank you. The nougat looks lovely, but it sounds a bit scary to me – not easy at all. Its a fairly soft nougat Joanna, not break your tooth on it kind of hard. I’m a convert with nougat now, I will eye it off anywhere I go, and check out ingredients for pinching different ideas.